Ms. Pac-Man gets a facelift and a fresh series of adventures with Ms. Pac-Man: Maze Madness. Pac-Land is under attack by Mesmeralda, a horrible witch who has turned the Enchanted Castle into a ghost-ridden haunted house. Adding to the misery is the disappearance of the Princess. 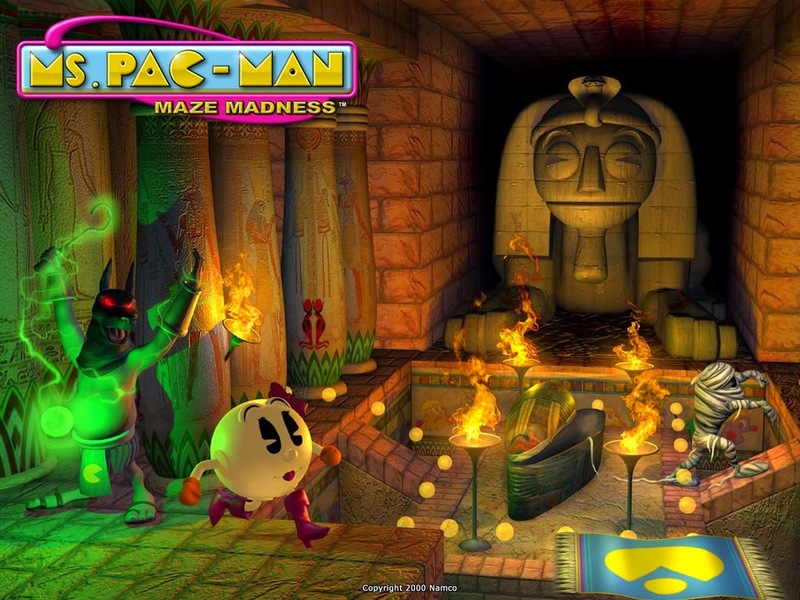 Thanks to Professor Pac and his nifty Pactrometer, Ms. Pac-Man can pass through the force fields separating the four Wonders of Pac-Land: CleoPactra, Pac Ping Harbor, Crystal Caves and Haunted Halloween. To save the day and prevent darkness and chaos from spreading, Ms. Pac-Man must find retrieve one Gem of Virtue (Truth, Wisdom, Generosity and Courage) from each of the four lands. Ms. Pac-Man: Maze Madness gives you a three-quarter perspective, top down view of each of the game's 180 scrolling mazes. There is much to do in each land. As you guide this female version of Pac-Man around the pathways, you must eat all the Pac-Dots, search for hidden areas and collect cherries, strawberries, peaches and other fruits. You must also contend with Inky, Blinky, Pinky and Sue, ghosts who follow you around and make your journey difficult. To temporarily turn the tables on your foes, you can eat one of several Power Pellets, which make you invincible and give you a hankering for ghosts. In addition to ghosts, you must also contend with other maze-roaming enemies and a number of obstacles new to the Ms. Pac-Man universe. These include sphinxs, alligators, centipedes, hellhounds, falling boulders, ice corridors, bolts of lightning, nitro boxes and more. A number of puzzle elements have also been introduced, such as opening and closing switches and gates, pushing buttons, finding keys to unlock doors and pushing moveable blocks to access areas. 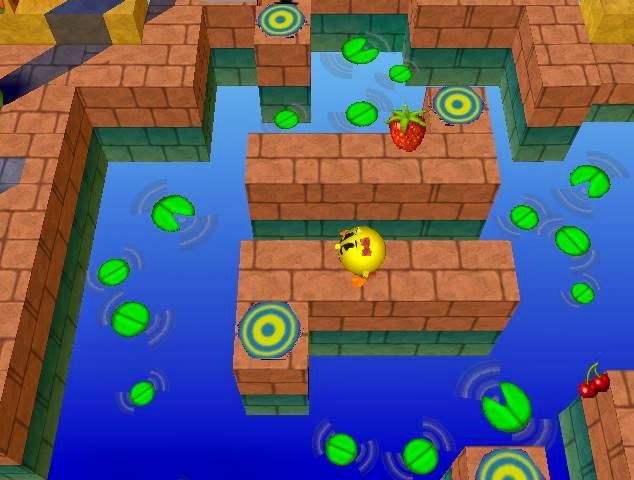 Other elements of gameplay include moving platforms, warp portals and popper pads (for jumping). Despite all the activity, no buttons are used in regular play, only the control pad or stick. Ms. Pac-Man: Maze Madness also features a number of multi-player games. Dot Mania is a race to see who can be first to eat 80 Pac-Dots. If you get hit by a ghost, you lose ten dots. You can grab moneybags to make other players lose dots, don sneakers to run faster, dash chili pepper to burn other players and gobble cake to become big and indestructible. You can even generate lightning to shock other players. In Ghost Tag, players begin the game as ghosts! When you see the Ms. Pac-Man icon, try to get to it so you can become Ms. Pac-Man. Once you assume the role of the feminist dot-gobbler, begin munching Pac-Dots as fast as you can. If you are a ghost, try to catch Ms. Pac-Man so you can turn into her. The first player to eat 50 Pac-Dots is the winner. Dr. Bomb randomly chooses a player to hold a bomb that counts down from 30 seconds. To get rid of the bomb by passing it to another player, simply tag that player. When the timer reaches zero, whoever has the bomb gets blown up; bombed players turn into ghosts. When you're a ghost, you can maneuver around the maze and block other players. The winner is the last non-ghost player. Classic Ms. Pac-Man is also included in the package. There are four different non-scrolling, 2D mazes, each of them filled with Pac-Dots that you must eat. For bonus points you can gobble one of four Power Pellets in order become invincible and turn the tables on your enemies, those four pesky ghosts. 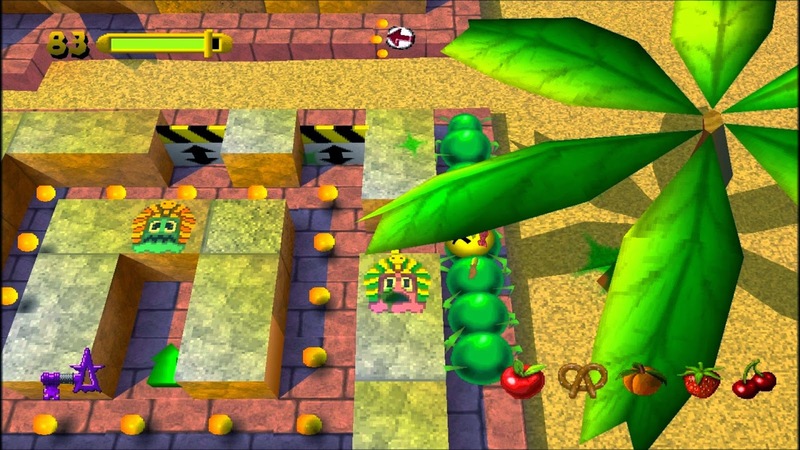 You can also munch fruit treats that bounce around the mazes. When you clear a maze, you move on to the next. I'm always a little apprehensive when trying out newer titles based on legendary arcade games (I've yet to recover from the awful Galaga--Destination: Earth for the PlayStation), but sheer curiosity combined with a longing to keep the oldies alive and well keeps me clamoring for more. With Ms. Pac-Man: Maze Madness, I was pleased to discover that it's one of the better classic makeovers on the market. Even more fun than Pac-Man World, this game has smooth, simplistic controls, colorfully cute 3D graphics, and tons of levels. The levels are short and there are save points galore, so you can play the game for a few minutes at a time or for a couple of hours or more. Obviously, the differences between Ms. Pac-Man: Maze Madness and the original Ms. Pac-Man are large in number and vast in scope. However, the most important difference revolves around the newer game's heavy reliance on puzzles, most of which involve finding keys to open doors and pushing blocks in the proper sequence or into their proper positions (such as filling gaps in the maze pathways). No longer is it simply a matter of munching dots and avoiding (or munching) enemies. The many puzzles in the quest mode (the primary portion of the game) are fun, but they are very easy to figure out. Unless you are a younger or less experienced gamer, you will rarely get stuck in a level. Also, the dot-munching, enemy-avoiding action is easy and lacking in intensity; you are rarely overwhelmed, and once you eat a monster, it won't come back (unlike the original game in which enemies return after a few seconds). The quest mode is fun, but lighthearted and not quite as challenging as some veteran gamers will require. The original Ms. Pac-Man, which, thankfully, is included in the package, is more challenging and much better in terms of reflexive gameplay. It doesn't have any puzzles to speak of, but it's a blast to play and gets faster and more furious as you go. Trying to outwit the ghosts and gobble all four of them while revved up on a single energizer is timelessly entertaining. Where Maze Madness truly shines is in its multi-player games. Ghost Tag is a fun and crazy game that will keep you and your friends laughing. It's a hoot when a group of ghosts are together and different players keep turning into Ms. Pac-Man. Dot Mania and DA Bomb are fun as well. All three games will rev up your competitive spirit while greasing up your funny bone. Old-school gamers won't necessarily take to the quest mode of Ms. Pac-Man: Maze Madness because it's more about puzzle solving than dot munching, but it's a fun game nevertheless. All gamers should enjoy the classic game and multi-player modes.